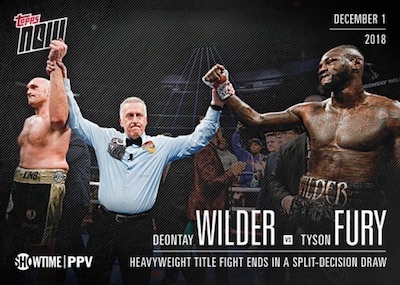 Bringing the print-to-order format to the ring, 2018 Topps Now Showtime Championship Boxing hypes key fights with pre-match cards, post-match results, and even limited relics and autographs. Keeping to the Topps Now norm, the online-exclusive cards are generally sold for just 24 hours. 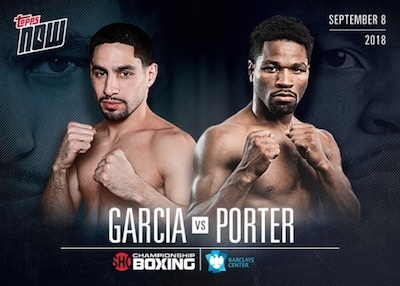 Starting with the September 8 battle between Danny Garcia and Shawn Porter, the 2018 Topps Now Showtime Championship Boxing checklist provides coverage of select fights on the network. The main cards are issued as print-to-order collectibles and priced at $9.99 per card. These have no set limit but the total amount is capped at the number sold during the 24-hour window. On the other hand, the limited mat relics and/or autographs are numbered and carry a higher price tag. Announced print runs (PR) noted. 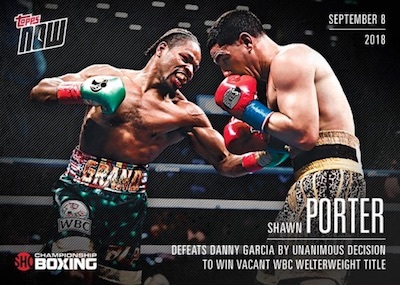 Shop Now Boxing cards on Topps. Fight took place on September 8, 2018. Fight took place on December 1, 2018. Buy on Topps.